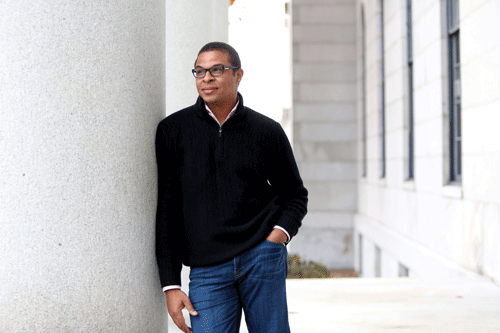 Roland Fryer does not want to be thought of as an exception, even though at age 30 he became the youngest African American to receive tenure at Harvard, as an economics professor, and at age 34 he received a MacArthur Fellowship for his work using economics to study — and try to find fixes for — racial inequities in education and in American society in general. Fryer's life's work has become trying to change the odds. Trying to make his path less exceptional. Trying to increase the probability that African Americans can change their place in society, using education as the lever. So that may be why Fryer — as a 25-year-old newly minted Ph.D. who had just come to Harvard to be part of the Society of Fellows — reacted so viscerally when a reporter from a major newspaper threatened to out exactly how exceptional he was: a man whose family members were in prison for dealing crack, who had grown up in a profoundly unstable home but had made it to the pinnacle of academia anyway. Fryer had always pretty much kept his life story to himself. When the reporter came to him saying he was going to pull back the curtain on his family life, "I was scared," Fryer, now on the Ed School faculty, told me in his office in the Littauer building. "I was really worried that people around here would care. It was already enough that I didn't feel like I belonged. But I didn't want them to feel like I didn't belong." Fryer went on the offensive, and decided to let Stephen Dubner (who at the time was working on the book Freakonomics with Fryer's thesis adviser from the University of Chicago, Steven Levitt) reveal his story in The New York Times Magazine, in the 2005 article "Toward a Unified Theory of Black America." It was a way of "putting it all out there so that nobody else could, so I didn't have to go through it again," Fryer says. Fryer told of a childhood bouncing between the home of his grandmother, Farrise, in Daytona Beach, Florida (a schoolteacher during the day; she also worked in a deli making sandwiches in the early morning and at a liquor store at night to make extra money for the family) and the home of his father, Roland Sr., in Lewisville, Texas. Life with Roland Sr. was toxic: The elder Fryer drank, gambled, beat up his girlfriend and his son. He was fired from his job at Xerox for sexual harassment and later convicted of sexual assault. At one point, when Fryer was around 12, he told his father: "If you could just not be a negative in my life, I can handle it from here." But Roland Jr. had his own troubles; to make extra money he sold counterfeit purses and stole from the cash register at McDonald's, where he worked. He drove his car around without a license, before he was 16, hung out with a tough crowd, got into fights, and carried a gun for protection. At one point he was arrested at gunpoint by the police, who questioned him for hours before releasing him (they had mistaken him for a drug dealer). But there were some lifelines that Fryer grabbed on to. When he wasn't spending time with his grandmother, he talked with her every day, up until her death about two years ago. "She was the anchor in my life," Fryer says. "She taught me everything I know, except for economics, though she would claim that she's the original economist in the family, because she made so much out of so little." During his early years in Texas, Fryer would call his grandmother when he got home, and talk with her for hours until his father walked in the door. "I was telephone-parented by my grandmother," he says. He was a good athlete, and while he didn't discover his capacity to work hard academically until college (he recalls only two times before college when he studied), he put out his full effort on the football field and the basketball court, and received a scholarship to play basketball at the University of Texas–Arlington. Once there, up through his first calculus exam, Fryer continued his pattern of minimal studying. But then he got a 45, and started to panic. "I can't fail out of here," he recalls thinking. "I don't want the future that comes if you don't graduate from college." So he sought out a student making straight As and asked for her secret: 15 hours of studying per exam, she told him. This was when Roland Fryer Jr., following his grandmother's example, started working prodigiously hard — and he hasn't stopped. "I work as much as I humanly can. Sometimes it's too much, frankly," he says. He thought about majoring in communications, English literature, philosophy, or sociology. But then, spurred by the worry of earning enough money after college, he took his first economics class, as a prerequisite for becoming a business major. On the first day, the professor explained that economics is based on the belief that people are self-interested and maximize that self-interest. Then the professor began to talk about trade between countries and notions of comparative versus absolute advantage. Fryer glanced around the room and saw looks of confusion on people's faces, though to him it all seemed both simple and elegant. "Things had never been so clear to me," he says. But the natural affinity and skill he had for deciphering the equations and theories of economics were not the only things that drew him to the discipline. It was also that when it came to understanding data sets, his life experience had little bearing. In economics, unlike in English literature class, "whether or not you'd been to Europe or where you'd summered didn't matter, as long as you could solve an equation," he says. Fryer raced to finish his course work, earning his bachelor's degree in two and a half years. For graduate school, he went to Pennsylvania State, but was able to do much of his dissertation work at the University of Chicago since both schools are part of the Big Ten network. The department in Chicago was influenced by a group of scholars who broadened the definition of economics to apply to issues and questions that were not traditionally considered a part of the field. Fryer fit right in. "I always thought, 'Wow, look at these tools; they're so powerful, so clean, so carefully constructed. But they're being used to study optimal corn growth whereas problems like affirmative action or immigration or gun violence — the ones we leave up to the talking heads — are the exact questions where your individual biases are likely to come in,'" he says. "They are exactly the ones where we need the most mathematical or technical tools." One of Fryer's mentors was Gary Becker, who wrote his Ph.D. thesis on the economics of discrimination, and was awarded the Nobel Prize for this and other pioneering work that turned the lens of economics toward social problems. "I tease that Chicago's the only place where economics is taught as a full-contact sport," says Fryer. "They didn't care about who you were or what you were doing. The question was: Could you either come up with a formal analysis of it, or could you bring data to bear on it." An example is Fryer's paper "Acting White," spurred by his own experience as a student, of shying away from his academic achievement as a way to fit in. (Fryer mentions that people would sometimes ask him whether a paper like "Acting White" is really economics. "After being at a place like the University of Chicago and studying under Gary Becker, I'd say, 'It is now!'") As Fryer described it in an interview with The Washington Post: after basketball practice one time, his coach was going from player to player, making sure their grades were high enough for them to be eligible to play. When he got to Fryer, the coach said, "I know you're doing fine," and moved on. "And I told him, 'Hey coach, don't do that.' I wanted to be treated like everybody else in the locker room. I didn't want to be singled out as anything." For the paper, Fryer came up with a new, objective way of measuring popularity. While previous studies had relied on students' self-reporting of their social status, Fryer asked each student to list his or her friends, and then he cross-checked the friends' lists to see whether they matched up. He combined the popularity measure with data on GPA, and found that while white students' popularity increased with academic success, high-achieving minority students suffered socially. Fryer argues that this social pressure to underachieve has serious ramifications on how minorities do in school, and could even go towards explaining gaps in test scores and in admissions to elite colleges. The study typifies Fryer's work in several ways in that it takes one aspect of a larger societal problem, one that has a whiff of controversy about it, and finds an ingenious way to study it and quantify it. Fryer came to Harvard in 2003 for a three-year research fellowship before joining the faculty of the economics department. Arriving at Harvard, he says, was like "landing on the moon." One of the people who helped him settle in was Harvard President (and fellow economist) Larry Summers, who would invite Fryer out to lunch each month to talk about his research. Summers appreciated Fryer's relentless and creative search for hard data in a field where it can be difficult to set up a rigorous study using control groups. "Roland is an evidence-driven guy rather than prejudice, instinct, or tradition, and that's clearly what is needed now," Summers commented in a 2007 profile of Fryer in The New York Times. Systematically, Fryer set out to understand and quantify the problem of the black achievement gap in America, with the hope that hard, scientific data would shed light on the most effective ways to narrow the gap. To further this work, Fryer started the Education Innovation Laboratory, or EdLabs, as an incubator for testing out and implementing new ideas. At the foundation of Ed Labs are the studies that inform all of its recommendations. Fryer believes that writing peer-reviewed papers — creating the hard data that can shape questions of education — is the most important thing he does. "Because it needs to be right. It needs to be fact-based," Fryer says. "When you write something and it's published in a good journal, it becomes part of the canon of what the next generation learns. It lasts for years and years. I was just reading [economist David] Ricardo, writing about the idea of comparative advantage in 1817. These ideas can last for a long time." Guest lecturing in a packed Sanders Theatre this fall, Fryer gave students in an economics class an intellectual tour of the dire nature of the problem, and of his efforts to build a scaffold of evidence-based research to try to help fix it. Dressed in jeans (he'd come that morning from New York, and said he hadn't been willing to risk waking up his two-year-old daughter to grab his suit from her room), walking casually around the stage throughout the lecture, Fryer showed some 2011 data from the National Assessment of Educational Progress of eighth-graders in reading and math. There was not one city — not one — where more than 25 percent of blacks or Hispanics were proficient in reading or in math. "To me that's a national emergency. How can we possibly have a country where that's true?" Fryer said. "If you don't have a sense of humor about this data, you'd literally jump off the roof." Some of the studies, he told the students, like his paper "Racial Inequality in the 21st Century: The Declining Significance of Discrimination," published in 2010 in the Handbook of Labor Economics, led him to conclusions that he didn't want or expect to be true. This study showed significant differences between black and white outcomes: a 28 percent difference in wages; a 190 percent difference in unemployment rates; a 234 percent difference in home ownership. Yet when Fryer controlled for test scores, some of these disparities declined significantly; others melted away. The way Fryer saw it, the differences in how black lives turned out couldn't be ascribed to racial discrimination per se, but to the fact that blacks were doing much worse in school than their white peers. "I hated these results," he told the class. "I called my grandmother and said, 'I don't know what to do. I know there's discrimination in the world, but I can't see that it's causing the differences that I see.'" Yet the study hinted at how powerful an intervention education could be. Many of his studies took him into controversial territory, including his investigation of whether incentives increase academic achievement (in most cases, no), and his investigation with Steven Levitt of whether there are systematic racial differences in mental ability among young children (no, when they're under the age of 1; yes, as they get older, hinting at the importance of environmental differences). I asked Fryer how he reacts when studies draw personal criticism, as this latter one did. While some criticism seems to roll off his shoulders, he hotly resents when critics imply that a topic should be off-limits. "When people say to me, 'Why would you even look at the test scores of 9-month-olds?' That I have no patience for. I just say, 'What are you worried about?' I am on a fact-finding truth mission. And frankly I don't give a s--- what anyone else feels about that," he says. "If they have other facts, great, let's put them all on the table. But I'm not going to, because of political convenience, not help kids [like the ones] I grew up with. This isn't philosophy for me. I truly believe in the power of social science to change lives." And are good schools enough to change lives? That was the larger question Fryer was trying to answer with "Are High-Quality Schools Enough to Increase Achievement Among the Poor," a study published in 2011 with Will Dobbie, then a Ph.D. student at Harvard Kennedy School. Fryer told the students in Sanders Theatre that he was trying to tease apart exactly where to intervene to shrink the achievement gap. "Should you give them schools? Or neighborhoods? Or both?" he asked the class. The scholars' laboratory was the Harlem Children's Zone (HCZ), a 97-block area where students from both inside and outside the zone attend what are often called "No Excuses" charter schools (with strict behavioral and academic expectations combined with longer school days and frequent assessments), and residents receive a range of community services. Looking at data from students who lived in the HCZ neighborhood and attended a Promise Academy charter school there, and others who only attended Promise, Fryer and Dobbie found that by eighth grade, both groups had closed the achievement gap in math. (For students who started in elementary school, the achievement gap in English language arts was closed as well; but this finding did not hold true for those who started in middle school.) In other words, the authors wrote, it's possible to address the achievement gap through education alone. (Writing about the preliminary results in 2009, New York Times columnist David Brooks made clear exactly how dramatic these results were. "Forgive some academic jargon, but the most common education reform ideas — reducing class size, raising teacher pay, enrolling kids in Head Start — produce gains of about 0.1 or 0.2 or 0.3 standard deviations. If you study policy, those are the sorts of improvements you live with every day. Promise Academy produced gains of 1.3 and 1.4 standard deviations. That's off the charts." But whatever the results were, good or bad, Fryer was going to publish them and learn from them. Geoffrey Canada, Ed.M. '75, the longtime president and CEO of the Harlem Children's Zone, describes how, when he first met Fryer, the economist told him: "'I would love to do a study on the Harlem Children's Zone, but there's one condition: if it turns out it doesn't work, I'm going to publish it and tell the world.' And I said, 'I think that's terrific because if it doesn't work, I don't want to keep doing it!' He is on an absolute mission and is prepared to follow the science wherever it leads." Two years later, Fryer and Dobbie collaborated again on "Getting Beneath the Veil of Effective Schools: Evidence from New York City." The authors found that traditional measures, such as class size, investment per pupil, and level of teacher education and certification, are not correlated with student performance. Instead, they identified five educational policies — frequent teacher feedback, data-driven instruction, high-dosage tutoring, increased instructional time, and a relentless focus on academic achievement — that account for almost half the variation between good charter schools and ineffectual ones. This idea, which Fryer calls the five tenets, lies at the heart of his work. "There's a growing consensus that these five tenets, and maybe a few more, are enormously important in educating poor children," Fryer told me. Fryer also said that his grandmother, who was always grudging with her praise and spent decades in the classroom, expressed the feeling to him that the five tenets were little more than common sense. "She said to me, 'Baby, they pay you for that?' I agree that the tenets are kind of obvious, but then the question becomes, if they're so damn obvious, why aren't we doing them?" Next, Fryer wanted to test whether these five tenets could work well in traditional schools, bringing them to low-performing schools in Houston (and later on in Denver). But rather than studying the effects of interventions made by others, this time he was measuring the effectiveness of his own work. Fryer and his colleagues at EdLabs worked with the superintendent to apply the five tenets to the failing schools: helping to hire new principals and new teachers, setting up a culture of no excuses and high expectations, and implementing tutoring in reading and math. When he examined the data, he saw that the five tenets had about 70 percent of the effect in traditional schools as they had in charter schools. While math scores improved substantially, reading scores did not, a result that Fryer has found in other studies as well. As he speculates in "Injecting Charter School Best Practices Into Traditional Public Schools: Evidence from Field Experiments," "[A] leading theory posits that reading scores are influenced by the language spoken when students are outside of the classroom … [The researchers] argue that if students speak non-standard English at home and in their communities, increasing reading scores might be especially difficult. This theory is consistent with our findings and could explain why students at an urban boarding school make similar progress on reading and math." The last study Fryer laid out for the students in Sanders was his most recent with Dobbie, "The Medium-Term Impacts of High-Achieving Charter Schools," which starts getting at the real nub of Fryer's quest. It's not the educational results themselves that matter most; instead it's the life and opportunities that a good education smooths the way for. The study gives evidence that the influence of good charter schools can last long after the students have graduated, with effects on pregnancy rates, incarceration rates, and the numbers who go to college directly from high school. "Those same schools that produced the high test scores produced a five-fold reduction in teen pregnancy," Fryer told the class. "Let's be human for a second. That's pretty crazy." Fryer won the MacArthur "genius" award for "illuminating the causes and consequences of economic disparity due to race and inequality in American society … through innovative empirical and theoretical investigations." This past April, at age 37, he was awarded the John Bates Clark Medal, given to the American economist under 40 "who is judged to have made the most significant contribution to economic thought and knowledge" (and 12 times a precursor to the Nobel Prize in economics). But Fryer is still impatient: There is so much more work to be done in terms of building the knowledge base on how to improve American education, in math, reading, and beyond, on a broad scale. 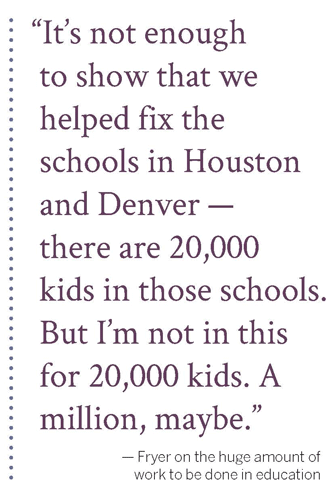 "It's not enough to show that we helped fix the schools in Houston and Denver — There are 20,000 kids in those schools. But I'm not in this for 20,000 kids," he says. "A million, maybe. We do a lot of patting ourselves on the back because one program with 2,000 kids worked. That's not enough, you know? I am just deeply unsatisfied with that." Essentially, Fryer wants to figure out what no one else yet has — how to create good schools for all those students at the bottom of the socioeconomic ladder, not just a tiny percentage of them. That desire is partly why he formalized his connection with the Ed School in 2015 as a member of the faculty, whereas before his collaboration was less official. Through his experiments over the last decade, through his work with EdLabs, Fryer has distilled what works in high-performing charter schools, and he's translated those tenets to improve low-performing district schools in Houston and Denver. But he hasn't yet figured out how to take the five tenets to scale. "That is part of what I'm hoping for with the Ed School, that they might be able to help me understand how to bottle that message," he says. Another way to share the message is through the students he teaches, advises, and works with at the Ed School. "For me it is not just about leading an organization that runs high-quality experiments in the field of education. In 20 years I need to be able to look back and say, 'These are 200 new students in this field who are created by the work that we did,'" he says. Dean James Ryan helped recruit Fryer to the school and has similar hopes for the exchange of knowledge that increased collaboration could bring. "Roland is doing some of the most interesting and important work in education," he says. "His presence at HGSE creates more opportunities for our students to work with him and for our faculty to collaborate with him — and for him to learn from them as well." 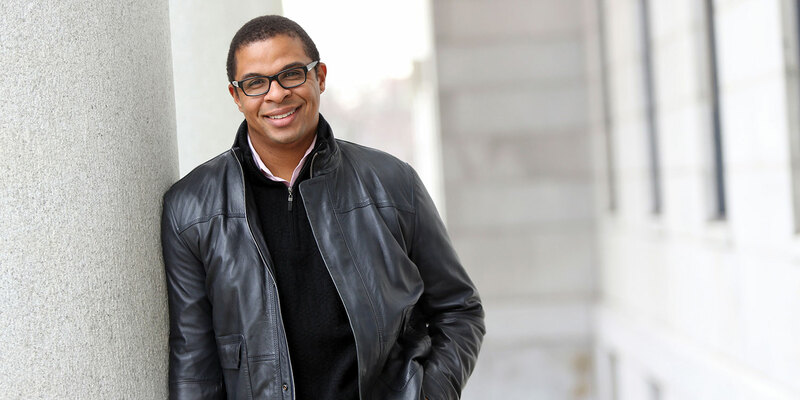 Roland Fryer does not want to be an exception. But it's also true that he's not afraid of long odds. It would be hard to find a starker challenge in American education than erasing the achievement gap for all those students whose prospects are dimmed by it. Does that deter Fryer? Not at all. "I have always been wired this way," he says. "Give me a 1 percent chance of helping a million; I'd rather have that than a 50 percent chance of helping 20." — Katie Bacon is a writer and editor who has written for The Atlantic, The New York Times, and The Boston Globe.